The crime happened on December 11. A 23-year-old woman with special needs who works at Goodwill got on a Cedar Rapids bus at about 4:15 that afternoon. When she realized she was on the wrong bus, she got off when the bus stopped near Lindale Mall. But the woman left her purse on the seat. According to Cedar Rapids police, a couple on the bus “took advantage” of the situation. Rather than turning the purse in to lost and found, the man and woman on the bus took the purse. A little less than two hours later, a credit card from the 23-year-old’s purse was used at a store in Marion. 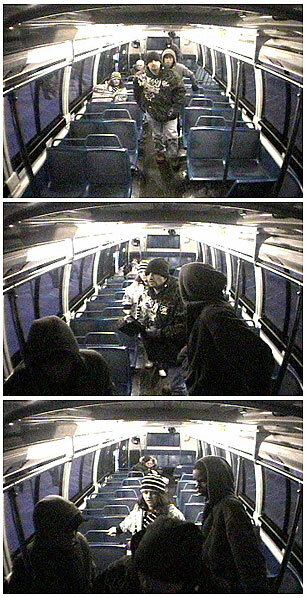 According to the photos Cedar Rapids police have released from the bus surveillance camera, the white female suspect “appears to be in her 20s” and has brown hair. The white male suspect has brown hair, but he has a small bald spot on the front of his head. Police say the two got into a white SUV after they used the stolen credit card. Cedar Rapids Police Sergeant Cristy Hamblin says the video from the bus shows a black man who was riding on the bus tried to talk the two thieves out of taking the purse. Call 1-800-CR-CRIME if you recognize either of the suspects; a reward is being offered for information which leads to an arrest.